This week at IFA in Berlin LG introduced a new flagship UltraWide display. The new monitor is called the LG 38UC99 and it's LG's largest UltraWide display to date, with a diagonal size of 37.5 inches. With a horizontal resolution of 3840 pixels, and support for 99% of the sRGB color gamut, LG appears to be positioning the monitor as one well suited for displaying UltraHD content filmed in an aspect ratio of 2.35:1 or 2.40:1. Gamers aren't left out either, with support for AMD FreeSync being included as well. The basic specifications for the panel are listed below. There aren't any big surprises as far as the panel goes, with a resolution of 3840 x 1600, a 5ms GtG response time, a peak brightness of 300 nits, and a contrast ratio of 1000:1. When you look at the monitor as a whole there are a few interesting points. The monitor has a built in USB 3.0 hub, which is generally expected of high end monitors, but in this case there are two USB Type-A connectors as well as a USB Type-C connector. LG has noted that the Type-C port can charge mobile devices, but there's no word yet on whether they support high wattage charge modes as part of the USB Power Deliver spec. The monitor also has two 10W speakers, and it can be paired with smartphones or other devices via Bluetooth to play audio wirelessly. I would expect that most users interested in buying the LG 38UC99 for watching movies will also have a good set of speakers to go with it, but the feature is there for users who may not have enough desk space to fit such a large monitor and a sizeable pair of speakers. 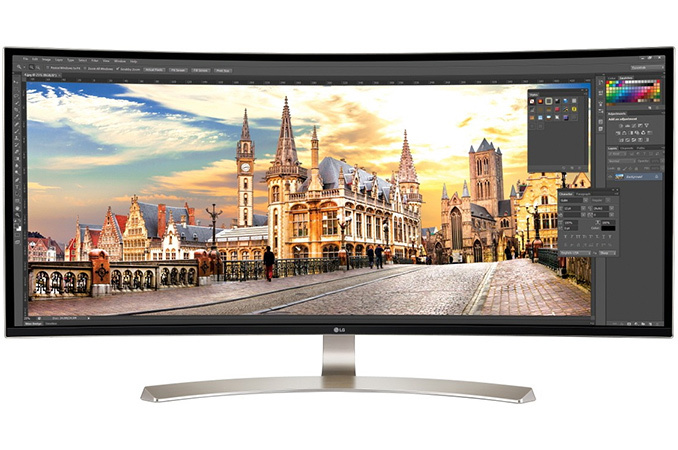 LG can really be credited with bringing 21:9 displays to market in any significant capacity. A few years ago it was just a niche form factor, and prior to that it didn't really exist at all. Since then it has been adopted by many different users, including fans of movies, gamers, and users looking to improve on productivity without having to set up two separate displays. In the case of the 38UC99 the display is curved, which may limit its appeal among some groups, particularly those who need proper accuracy for geometry displayed on the monitor like users doing computer assisted design work. Right now the LG 38UC99 doesn't have an official price, but several reports have stated that it will cost $1499 at launch. That places it strictly in high-end territory, but that's not really a surprise for a monitor of this size with these specifications. It is a shame that 16:10 is all but dead at this point. For dual monitors where you have lots of horizontal space, the extra vertical was so nice. My HP zr30w is an IPS 2560x1600. This is the first monitor that feels like an upgrade. Can you really complain once you have this many pixels at your disposal?